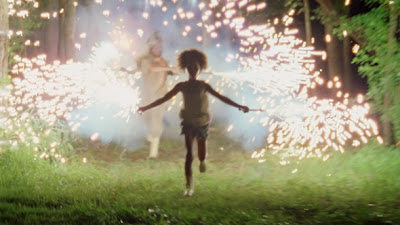 I came to BEASTS OF THE SOUTHERN WILD with high expectations. The debut feature from writer director Benh Zeitlin had been widely praised at Cannes and Sundance, winning the Camera d'Or and the Grand Jury Prize respectively. I actually passed up the opportunity to watch the movie in my hotel suite in the US a month previously (such being the oddities of a widely spaced international release calendar) because I wanted to experience it for the first time on the big screen. The movie left the gate with a furious energy and an anarchic magic that was captivating and entrancing. Little Quvenzhané Wallis plays Hushpuppy, a young girl living in 'The Bathtub' - a derelict, ramshackle island off the coast of New Orleans - amongst a close-knit community of resolutely independent, wonderfully eccentric, ramshackle people. Hushpuppy can hear animals hearts beat and takes all the wild tales of aurochs and icecaps cracking and women so beautiful they can set water to boil literally. And half the joy of the film is listening to this little girl express herself with fierce conviction about things to wacky and weird that you fear for her future but also hope she'll never be dressed up and sanitised like a 'normal' kid. And that's of course happens. The first act of the film ends with a Katrina like storm that the Bathtubbers refuse to flee. The second act sees them laugh at the 'pussies' who left, but struggle to survive as the saltwater refuses to drain and the animals start to die. The third act sees them forcibly evicted and transported to a sterile camp - the fate of Hushpuppy and her father hanging in the balance. What I love about the film is that it turns every preconception you had on its head. To be sure, Hushpuppy is a glowing advertisement for childhood neglect - her father (beautifully played by amateur Dwight Henry) is a violent alcoholic - on the other hand he fills Hushpuppy with self-belief and brutal raw survival skills. We should be happy when we see her cleaned up in a pretty dress, but that's not how it is. As raw and brutal as that relationship is, it's so authentic an so brave you have to appreciate it. What I didn't love about the film was the shooting style - and that's a surprise because after all, it won the Camera d'Or. I see how Ben Richardson's close up cinematography captures the gnarliness of nature, but so much of the handheld work is just too shaky for comfortable viewing. So many times I thought, this is a great concept, and I see what they're trying to do here, but I wish there was a more experienced DP involved. I also felt that the movie lost a lot of pace and energy in its final act. I guess that's the point in a way - being forcibly evicted saps some of the gonzo energy of the Bathtub crew and besides, Wink is in a bad way. But still, there should have been a counter-veiling force - a build in energy and magic and wonder from the appearance of the big southern beasties. But no, that attempt to genuinely jump the magic realist shark just didn't pay off for me. My sense is that if Zeitlin had wanted to go down that route he should have done it much bigger and much earlier. So, I did have a lot of problems with the movie, some of which were to do with the hype, but others of a more technical nature, which I think would've bugged me anyway. But overall, I love the fact that this movie got made - that such a specific culture got documented, and that such wonderful actors were discovered. There's something really new and unique about the perspective and the story in the film, and you don't say that too often in contemporary cinema. Even if I have my reservations about this movie, I'm still astounded and happy it got made, and I can't wait to see what Benh Zeitlin does next. BEASTS OF THE SOUTHERN WILD played Cannes 2012 where it won the FIPRESCI prize, the Camera D'Or, the Prize of The Ecumenical Jury - Special Mention and the Prix Regards Jeune. It played Sundance where it won the Grand Jury Prize Dramatic and the Cinematography Award Dramatic. It opened earlier this year in Russia, Canada, Israel, the Czech Republic, Puerto Rico, Australia, South Africa and Poland and opens this week in the Netherlands and the UK. It opens on Dec 12 in Belgium, on Dec 20 in France and Gemany, on Jan 3 in Denmark and on Jan 4 in Sweden.